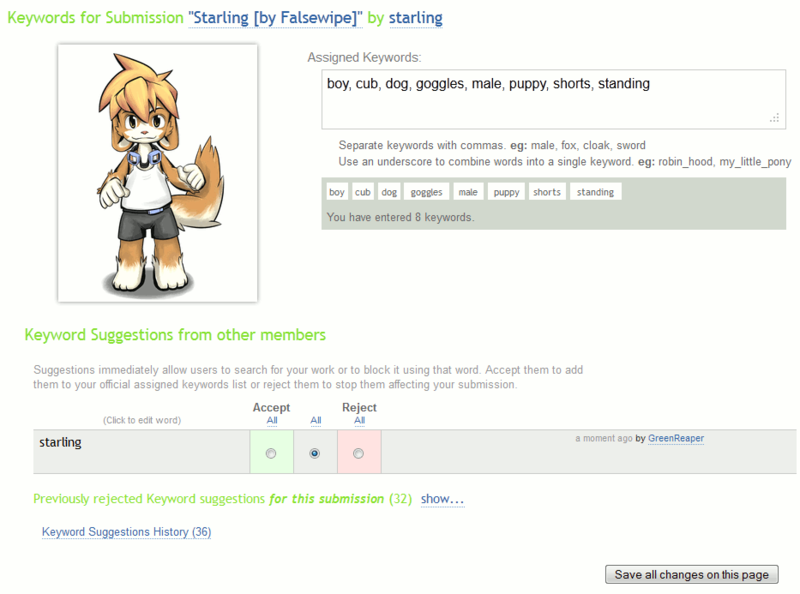 Furry art community Inkbunny has deployed a means for users to suggest and approve keywords. The long-anticipated feature was rolled out after several days of testing, leading to the addition of keyword history. Artists control acceptance of keywords, and can block individual keywords on one submission, or all under their account, as well as turning off suggestions per-submission or for all their work. Users can be banned from submitting keywords by an artist (or globally, by the moderators), and must have a three-month-old account to participate. Moderators remain the final arbiters in disputes. Among other updates, the number of thumbnails displayed per gallery page was doubled (to 60), guests can now be blocked from journals, and updated submission links now show the latest page. A co-located backup server was also added to complement existing offsite backups. Update (July 24): Mass accept and one-notice-per-hour have been added to the keyword feature. You should probably also mention how that compares with other sites. For example FA doesn't support tag blocking or community tagging. SoFurry also uses the tag blocking feature and has supported user-suggested tags since August 2011, almost a full year.